I have a confession to make. I’ve never considered myself a great lover of the fantasy genre. I could never seem to get into Lord of the Rings and have never once attended a Ren Faire. Then along came a little show called Game of Thrones. All of a sudden I found myself dreaming of the Iron Throne. The books, the show, the costumes, the cinematography… just everything is raw, extreme, and beautiful. I also have to laugh sometimes when inspiration hits. 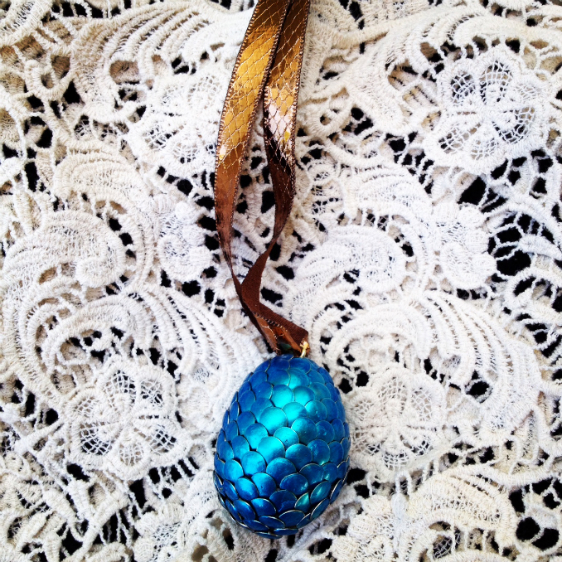 Where did I come up with the idea of doing a Dragon’s Egg DIY? Yes, you read that right. Strolling through the beauty aisle and spotting a gorgeous blue/teal iridescent nail polish had me dreaming of Daenerys Targaryen and her beautiful scaly charges. I knew there just had to be a way to use this simple, everyday beauty item to create something unique. Tacks ($1/200 @ Dollar City) – Yes, the bane of 1950’s teachers existence. I found a box of these in my local dollar store. Always expect to use more than you originally think. Iridescent Nail Polish ($1.99 @ Target) – The color I used was Sinful Colors in Love Nails and was a bargain at just $1.99. Foam Egg ($3.99/6 @ Beverly’s) – Beverly’s craft store had two types of foam eggs: traditional styrofoam and smoother, compressed foam (which is what I chose). I started this project by punching my tacks through a piece of cardboard I had lying around the house. Keeping the tacks as upright as possible helps keep the polish from dripping and creating an uneven surface. 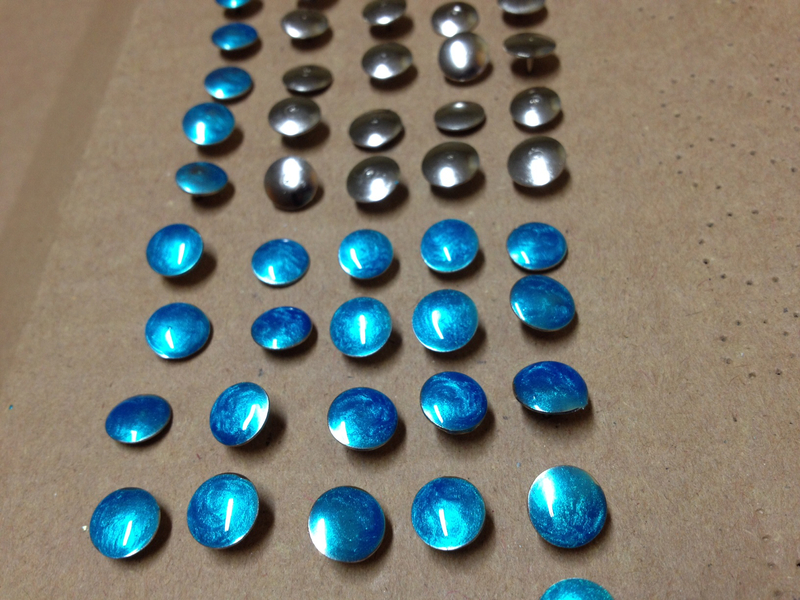 Paint over the entire surface of the tacks with your nail polish of choice. Don’t be afraid to apply it quite liberally! Remember, you are not painting your nails. Half the fun of this project is experimenting with swirling your brush and making great unintentional light patterns. After your “scales” are thoroughly dry, it’s time to attach them! This step is much easier than I thought but I definitely needed more tacks than I originally planned for. (I started with 50 tacks; in reality I needed almost all 200.) Start by pressing a tack into the top of the egg. *Note: I left a space at the top to put in an eyelet jewelry screw because I planned to make mine into a necklace. * Next, moving in a circle, continue to layer tacks by pushing them into the egg in order that they overlap. Keep going until you have the whole egg covered. That’s it! These dragon eggs would look fantastic grouped in a bowl, adding a good bit of fantasy flair to your home decor. 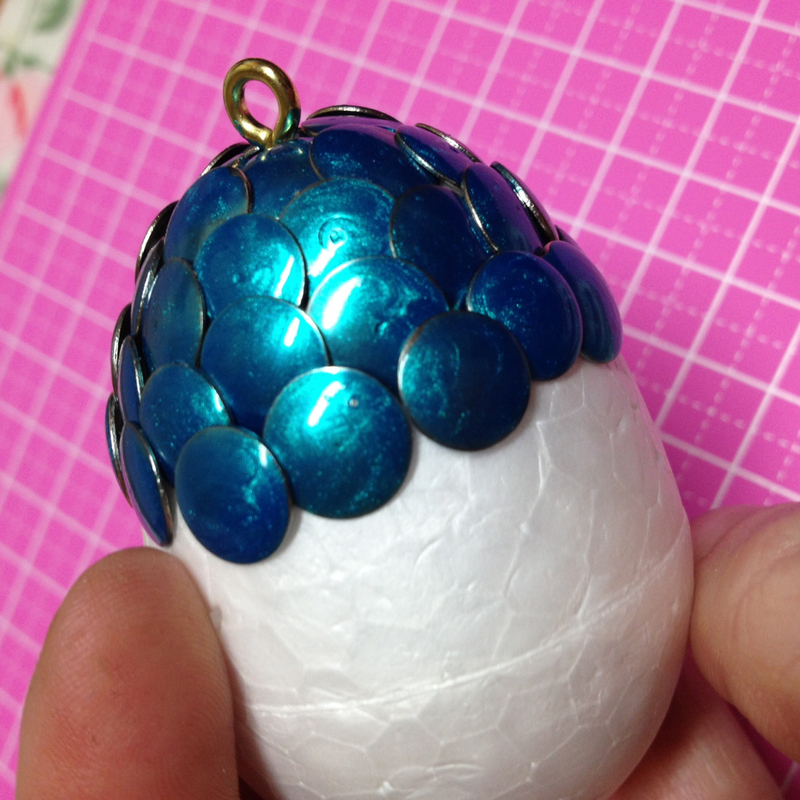 If you’d like to make your new dragon’s egg into a bold fashion statement, consider adding an eyelet screw (found in most jewelry stores) and a simple ribbon. The ribbon I chose looked a bit scaly in it’s own right and was $1.39/yd at Beverly’s craft store. Keep Calm and Dragon On! 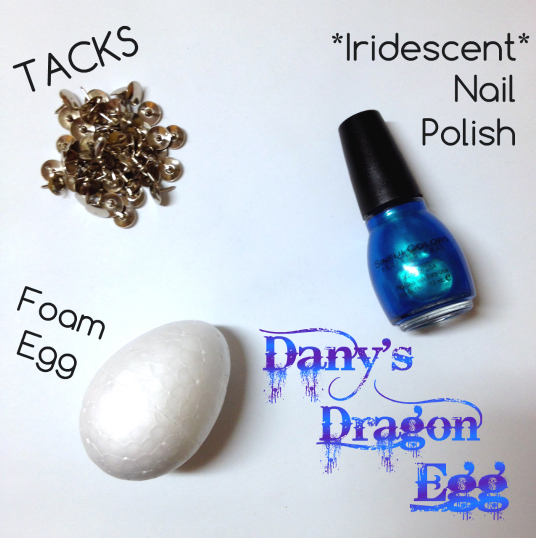 Tags: daenerys, dany, decor, diy, dragon, egg, fandom, fantasy, game of thrones, iridescent, nail polish, necklace, targaryen. Bookmark the permalink. Previous post ← Favorite Things – Boardwalk Treats Edition! But you just press the tacks into the egg? They don’t fall off after a while? I really love it, and I want to try it. Thanks! I just love the way the colors catch the light. I am going to be experimenting with new colors soon!